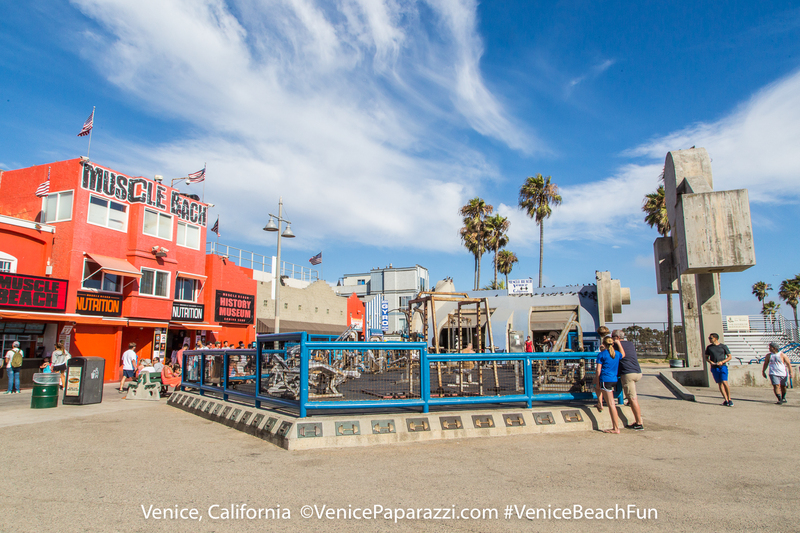 » Walk and be entertained on the Venice Beach Boardwalk! 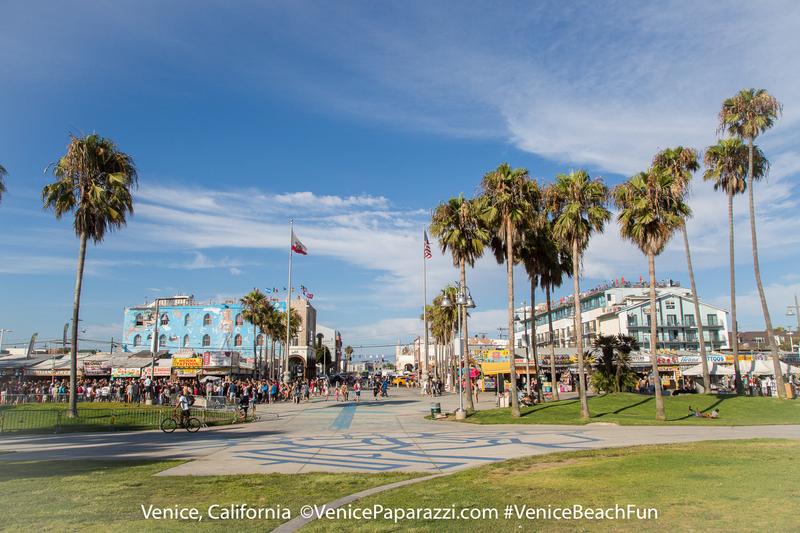 The World famous Venice Beach Boardwalk is not to be missed. If you are visiting the Los Angeles area, you owe it to yourself to come to Southern California’s number one visitor attraction. Stretching about one a half miles along the manicured sands of the Pacific Ocean, the boardwalk is a large part of what makes Venice unique. On the west side of the “walk” are hundreds of street vendors and performers. You can see everything from break-dancing to broken glass walking. Mimes to musicians, jugglers to jesters and everything in between make up the human landscape. You can have your fortune read, get a temporary tattoo or have your name written on a grain of rice. If souvenirs is what you are after then the boardwalk is the place to go. The Westside offers unique arts and crafts, odds and ends and one of kinds only obtainable here. Paintings, photos, rocks of various sorts and sculptures are among the popular offerings. On the Eastside are the store fronts of the boardwalk. Here you will find every sort of t-shirt under the sun. From the politically motivated to sexually charged to the plain old Venice Beach t-shirt there is sure to be one for everybody. In addition, there are tattoo and piercing stores, skate and surf shops, medical marijuana dispensaries and more. You can buy sun glasses, vaporizers, beer and shoes. This is all in addition to the large selection of restaurants, juice spots and bars. There is reason it so famous. Come and see for yourself! Hours of operation: Westside of the boardwalk shopping & performances starts at 9:00 a.m. Stores and shops on the east side of the boardwalk open between 10:00 a.m. -11:00 a.m., and usually close around sunset. Tattoo shops stay open late. Venice Beach is full of hustlers of all makes and models. Keep this in mind when you are approached by strangers. Nothing is free, and many view tourists as easy prey. Keep your belongings with you and understand that the people approaching you want your money. No dogs allowed on Sat, Sun, and holidays between Memorial Day and Halloween. The boardwalk is closed between midnight and 5:00 a.m. everyday. If someone hands you something, they are going to ask to for money. So, if you don’t want to pay for it, don’t take it. Now get out there and walk, jog, people watch, shop, and be entertained on the Venice Beach Boardwalk! There is something for everyone on Venice’s world famous Oceanfront Walk. Fun for the entire family! Take a moment to enjoy a performance by one of the boardwalk performers. We have performers eating fire, walking on glass, singing, break dancing, standing on stilts while juggling very large knives, singing, playing instruments and more. Rent a skateboard or skate the park! Check out Maui and Sons for the best in high performance skateboard sales, rentals and lessons! Maui and Sons: 1415 Oceanfront Walk, (310) 392 6284. Buy some handmade art from a real starving artist. There is a guy named Cacaguat who sets up near 17th ave. and has the some of best original paintings around. They are steeped in vibrant colors and dark Mexican folklore. 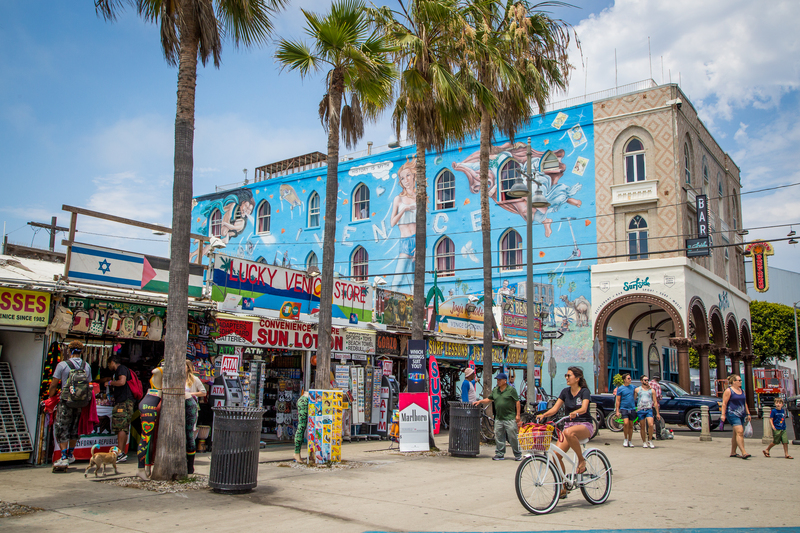 If you are a shopper or love to browse, the Venice Beach Boardwalk is filled with everything and anything you can imagine and more. Check out some of the best souvenirs here! Get a henna tattoo from the Cruz brothers @ 17th and the Boardwalk, they are the original and still the best Henna guys out there. Take a selfie at the iconic Venice Sign on historic Windward Ave. Check out Eddie between Westminster and Market for a custom toe-ring. Unique, fun and personal!! Smoke weed? You are not alone in doing so. Check out Green Goddess Collective for the finest green! Sit on a bench and watch the freak show roll by. You could even join the Krishna parade when they dance by. They welcome additional participants and the song they sing only has four words, so it is quite user friendly. Buy a t-shirt, 3 for $10 at most places. I like the one that has a picture of the devil and the caption says: God is busy, can I help you? Grab a work out or pose down at the Muscle Beach Gym. It costs $10 for a day pass. They have bumper weights to rival any Olympic or Powerlifting spot around and you get all of the color of the boardwalk to enjoy between sets. Also, the pass price includes access to a heavy bag and a speed bag. Very cool place, even if at times it is overrun with bikini clad men prancing around like they are lost the 80ʼs. Skate or watch the action at the 27,000 sq. foot Venice Skatepark. Two bowls, snake run, rails, stairs, and more! Keep your eyes out for amazing Venice murals and sculptures. Check out the Tour of Venice Murals on the Venice Beach Boardwalk. Watch, or play basketball, our court is portrayed in the film American History X. Let your kids run free at the children’s park! Two play areas available. Get a photo with alien sculpture at Titanic. Treat yourself to a gourmet sausage at Jody Maroni’s Sausage Kingdom! They are an iconic Venice eatery, having been located on Oceanfront Walk for nearly 40 years. Jody himself might even be there to grill it up for you! Fuel up at Muscle Beach Juice Bar! Power up on wheatgrass and ginger shots, fresh juice, smoothies, protein shakes, peanut butter and jelly, breakfast burritos, vegetarian options, more! 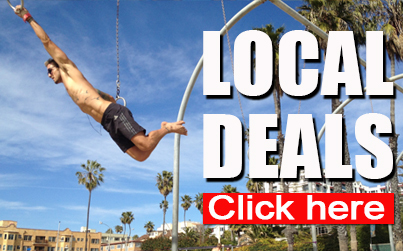 Located on the Venice Beach Boardwalk across from the world famous Muscle Beach Gym. 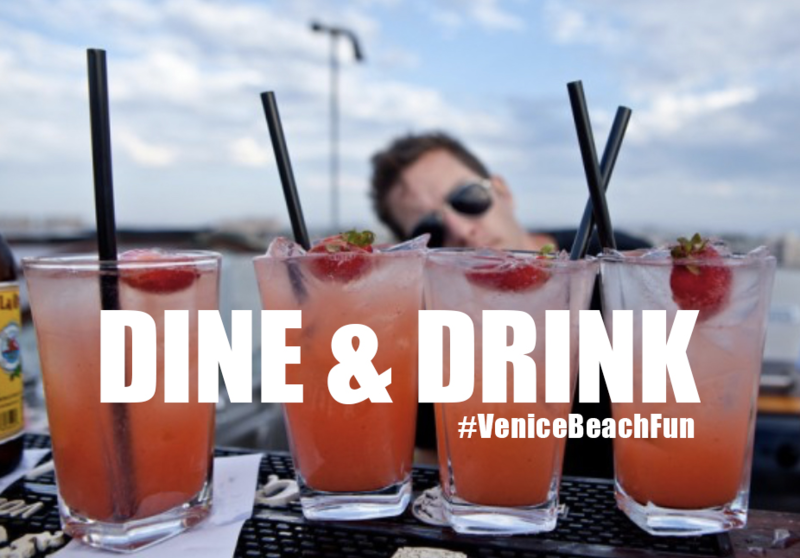 Click here for Venice Happy hours! 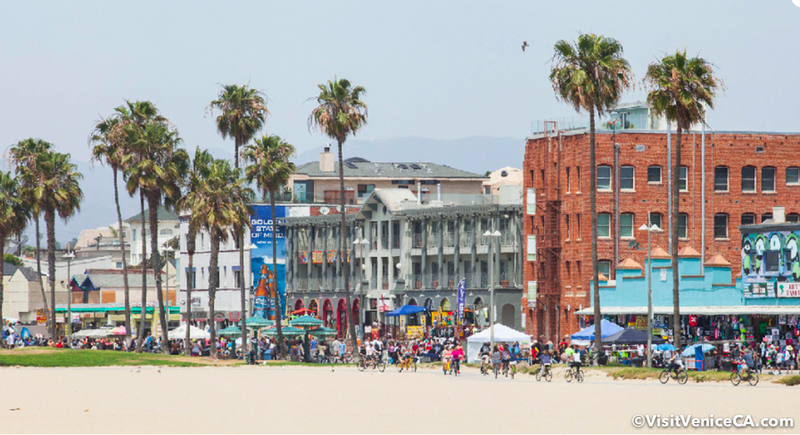 Check out this list of best places to eat and drink on the Venice Boardwalk! 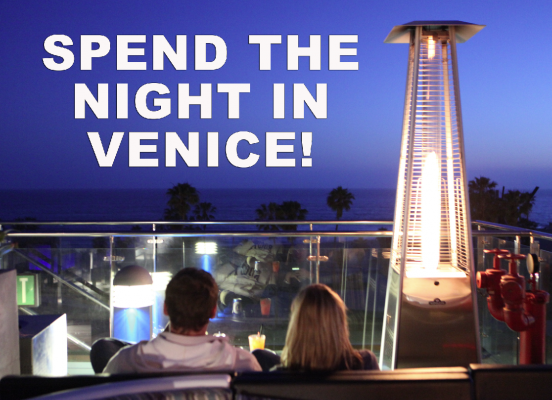 Check out this list of amazing Venice bars and restaurants. PARKING: City parking lots, private lots and street parking available. 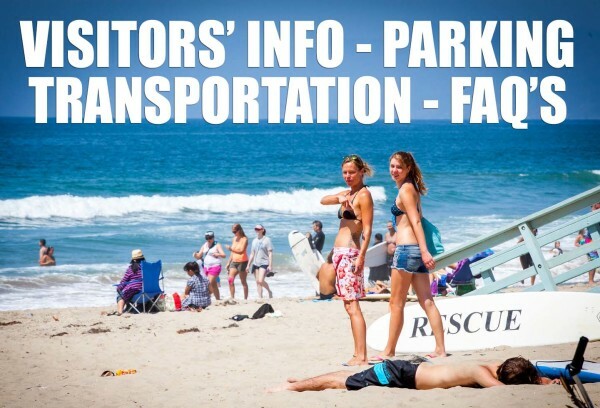 Click here for additional parking, directions & visitor’s info! Over 111 things to do in Venice, Ca area! 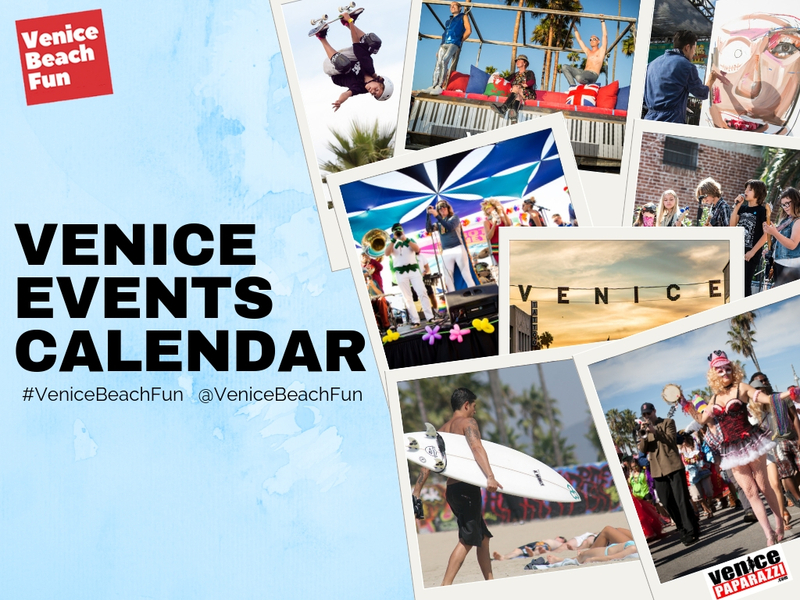 Check out the Venice Activities Checklist! And enjoy your Venice Beach experience. 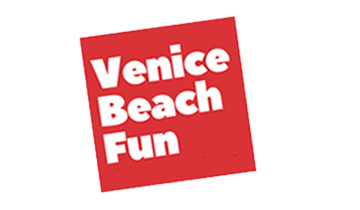 Find your Venice Beach Fun!